From left: Assistant Professor, Criminology James Popham; Brant Community Foundation Executive Director Joanne Lewis; and Brant Community Foundation Chair David Bailey. 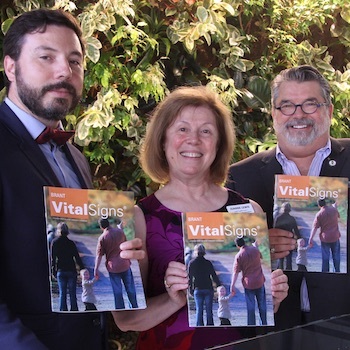 BRANTFORD – The Brant Community Foundation launched its inaugural Vital Signs report at an event held at Wilfrid Laurier University in Brantford Aug. 14. The Brant Vital Signs publication is a snapshot of the community at this point in time based on several measurements collected by Laurier’s research team. The report includes measurements on 10 key community vitality indicators such as public safety, health and wellness, economy, environment and more. James Popham, assistant professor of Criminology, and Laurier Criminology graduate students Nicole Coomber and Hannah Eggett, spent months collecting the data that was used in the report. The research team located relevant statistics and facts about the Brant Community Foundation catchment area, which includes Brantford, Brant County, Six Nations of the Grand River and Mississaugas of the New Credit First Nation. The team also conducted a telephone survey and focus groups to obtain further community insights. Brant Community Foundation Executive Director Joanne Lewis said the report is a community checkup. “As a community foundation, you want your grants to have the biggest impact by identifying what are the needs right now,” said Lewis. For each of the 10 indicators, the report outlines important statistics, the current impact on the community, things to celebrate, things to improve and what community members can do to help. Health and wellness, public safety and learning were ranked as the top three priorities for community members. A game allowing players to consider how grants are given to the community was also launched at the Aug. 14 event at the university’s Research and Academic Centre. Laurier’s Emily Flynn-Jones, a post-doctoral research fellow in Game Design and Development, along with Brantford Games Network Lab undergraduate students Laura Groza and Luke Simpson, developed the game, Brant Builder: Community Voices. “The Laurier Game Design and Development program is exclusively focused on creating games for social impact and strongly believes that games are a powerful way of translating knowledge and making it accessible to more people,” said Flynn-Jones. The game, which will be hosted on the Brant Community Foundation’s website, allows players to increase the happiness of a community by giving out grants to each of the four districts – rural, suburban, new development and downtown core. The goal is to give the grants to the region that it will suit best, increasing the happiness in each area and the overall community. The game allows the player to get a sense of the considerations that go into local philanthropic investment. The Brant Vital Signs report is available in hard copy at the Brant Community Foundation office at 30 Brant Avenue. Those interested can also call 519-756-2499 or email info@brantcf.ca for a copy. The report will also be available digitally at brantcf.ca.